Metal Craft Lifts offers a variety of upgrades to our standard Model 4000/5000 Vertical Boat Lifts. All bunks and guides are made from pressure treated lumber, marine grade carpet, and corrosive resistant zinc coated fasteners. After years of service, wooden bunks and guides can easily be replaced versus other composite options available on the market today. All of the bunk and guide options listed below are compatible with all four Metal Craft Lift models. Choose the option that best fits your boating needs! Metal Craft Lifts offers a Deluxe Bunk Kit as an upgrade to the standard bunks typically included with the purchase of Model 4000/5000 Lifts. The Deluxe Bunks feature an aluminum tube that reinforces the lumber for added support of watercraft. Metal Craft Lifts offers a Deluxe Side Guide kit for Model 4000/5000 vertical lifts. The Deluxe Side Guides feature “L” shaped guides that also ensure adequate footing for entering and exiting watercraft. The Metal Craft Pontoon upgrade includes hardware, bunks, and guides to allow for complete support of your Pontoon or Tritoon Boat. The Pontoon Upgrade is intended for pontoon boats with two round pontoons; Tritoon Boats will require an additional, adjustable standard bunks and hardware. Utility Side Guides by Metal Craft Lifts guides boat on to the lift with ease ensuring the boat is sitting evenly on the bunk supports. They are a great addition to any standard lift package. Metal Craft is an authorized dealer for Premier Metal Canopies featuring open-ended, closed-end and free-standing canopy systems. Premier Metal canopy frames features 3-1/2″ tall canopy rails, stronger bows and the ability to add end caps on either end or both ends at any time. The canopy fabric attaches to the canopy frame with marine grade velcro on the underside of the rail so it remains out of the elements year round and makes for easy installation. Canopy material is available in Top Gun Acrylic Coated Polyester and Odyssey III Vinyl. Contact a Metal Craft Dealer for color options. TOP GUN – Made from acrylic-coated 100% woven polyester fabric (600 denier), Top Gun Fabrics are ideal for harsh marine environments because they offer exceptional resistance to abrasion while maintaining superior strength and visual appeal. Top Gun is highly water repellent and resistant to both mildew and ultraviolet light making it ideal for a wide range of marine and automotive applications. Top Gun Fabrics weigh 11.5 ounces per square yard and are available in 20 standard color options. ODYSSEY III – Is an acrylic coated 100% woven polyester fabric (300 denier) with a clear back coat. It is characterized by excellent strength, durability, tear and abrasion resistance, dimensional stability, & UV and mildew resistance. ODYSSEY is a light weight fabric that provides long lasting durability without the higher cost and weight of heavier fabrics. The fabric weighs 6.5 ounces per square yard and is the best performing low end fabric on the market. Available in 18 stock colors. Metal Craft Docks is an authorized dealer for Extreme Max™ Boat Lift Boss Direct Drive Systems. The 120V key-turn direct drive system is compatible with the Lorenz winches used on Metal Craft Lifts. 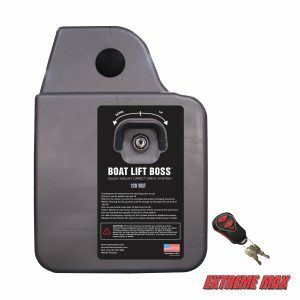 The Extreme Max Boat Lift Boss is the faster, easier way to lift your boat while maximizing lift capacity and minimizing strain. Each unit is wired and assembled by hand and is tested three times for quality control. Boat Lift Boss Direct Drive Models require quick-mount, lift specific installation kits for a simple installation and perfect fit. 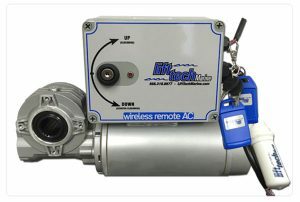 The 120V key-turn model with wireless remote option includes 1 remote and plugs into a ground fault protected circuit. Extreme Max Boat Lift Boss Systems has a 2 year manufacturer’s warranty. Metal Craft Docks is also an authorized dealer for Lift Tech Boat Lift Motors. The 110V key-turn direct drive system is compatible with the Lorenz winches used on Metal Craft Lifts. The Lift Tech motor has a 7,000 lb lift capacity. Each unit is wired and assembled by hand and is tested three times for quality control. Lift Tech Models require a simple installation and perfect fit for a Lorenz winch. Lift Tech Motors has a 2 year manufacturer’s warranty.